Good parents make sure their kids are prepared. That’s why we obsess over car seats, bike helmets and sunscreen. It’s why we pack lunches and track down soccer gear. It’s why we spend hours driving them all over town searching for supplies for big, school projects. We try to prepare our kids because we love them. We want to give them every advantage against the challenges life throws their way. Yet, when it comes to our kids’ spiritual lives, how well have we prepared our children to face the future? Will they be able to handle challenges to their faith? Do they know how to answer questions and articulate what they believe and why? If you’re not sure about the answers to those questions, you definitely need to check out an amazing new book called Keeping Your Kids On God’s Side by Natasha Crain. It’s a guide for parents to help our kids answer difficult questions about their faith. I’ve been following Natasha’s blog for the past year and when I saw she was writing this book, I requested an advanced copy to review because I knew it was going to be awesome. I was not disappointed. As our culture grows increasingly hostile towards faith, these questions will become more important than ever before. Our kids are going to need to learn to think critically and express their beliefs in a reasonable way. And prepare us she does. Keeping Your Kids On God’s Side covers all the big challenges to faith, including everything from the creation and evolution debate to how we know we can trust the Bible as a reliable historical manuscript. How can Christianity claim to be the only path to God? How can Christians believe miracles are possible? These are deep waters for sure, but Crain never lets it get boring. The author has a unique talent for taking deep and complex issues and putting them on a shelf that we can all reach. The chapters are concise and easily digestible. With tangible illustrations from everyday life, she makes this material so accessible that you don’t have to be a rocket scientist to get it. However, I also appreciated that while Crain keeps the chapters short, she includes plenty of references and links for anyone who wants to learn more. The fact is our culture is shifting, and we can either ignore it and let our kids flounder in a sea of skepticism or we can do what good parents do and prepare them to face the challenges that will come their way. In twenty years of Children’s Ministry, I have never read a book I would recommend to every parent . . . until now. Buy this book. Read it. And get ready to go on an incredible journey of faith and reason with your kids. P.S. If you’d like to read this book with a group, be sure to check out the author’s private Facebook group by March 1st where she’s going to be doing a read along with her fans and answering questions along the way. Disclosure: As I’ve already stated, I received a free copy of this book to review, but the opinions in this review are my own. This book is fantastic! Make sure you don’t miss a family discipleship post. Sign up here to receive more spiritual parenting tips, family devotions and resources delivered straight to your inbox. What are you put on earth to do? How can you noticed for it? 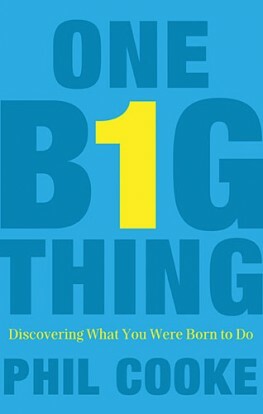 Author Phil Cooke says that the intersection of those two questions is what his book, One Big Thing, is all about. One Big Thing is about discovering your passion and finding a way to share it with others. Cooke says that this sweet spot is where you’ll make the biggest impact with your life. Drawing from his wide variety of experiences working with both non-profits and the Hollywood community, Cooke delivers plenty of great examples and insightful questions to help the reader zero in on where their life could make a difference. My biggest problem with One Big Thing is that was way too readable. I read it faster than I could process it. Though it has plenty of meaty content, I flew threw it in a little over a day. I practically inhaled it. It doesn’t hurt that I’ve always been borderline obsessed with discovering my purpose in life and Cooke keeps this topic engaging and fun. Discovering our unique passion, perspective and skill set, Cooke says, is the ticket to getting heard in a world full of people trying to be heard. It’s how we share what we love with the world and advance our causes or organizations. It’s even how we make a difference in our own family. If you’re searching to find your one big thing, the unique thing you were put on earth to do, or if think you know it but want to put it into action by getting others to notice it, this is definitely worth a read. I got my copy for free from Booksneeze in return for an objective review, but this one I would have paid for either way. Here’s the book trailer to check out for yourself.